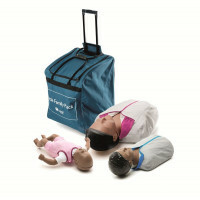 Laerdal's Little Family Pack of Manikins... Now Laerdal brings you realistic, affordable quality CPR training in one "Little" happy family package - the new Little Family Pack. Designed to reflect the realistic anatomical differences among an adults, a child and an infant. The new Family Pack comes complete with one Little Anne, one Little Junior, and one Baby Anne and a large bag on wheels to carry them. It's functional realism with all the essential features! 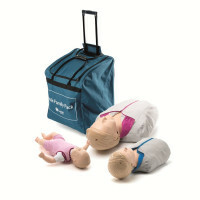 Your students will benefit from the most realistic, age-specific manikins on the market today. And you'll benefit from the convenience.